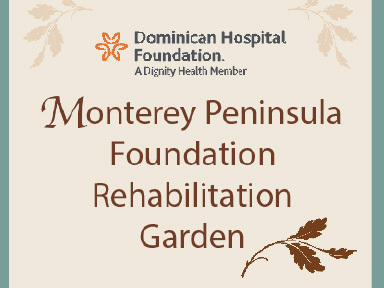 Now open at Dominican Hospital, the Monterey Peninsula Foundation Rehabilitation Garden was named thorugh a $500,000 grant by the Monterey Peninsula Foundation, host organization of the AT&T Pebble Beach Pro-Am and the PURE Insurance Championship. 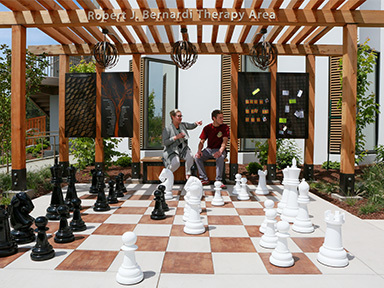 The Robert J. Bernardi Therapy Area Trellis, funded by Bob and Bonnie Bernardi, is complete with a life-sized chess set and peg boards for patients to utilize for speech therapy as well as hand-eye coordination. 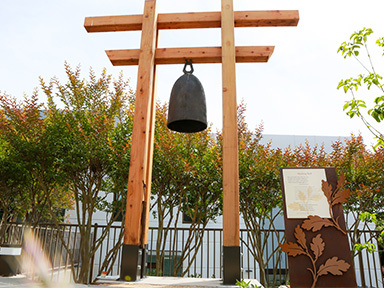 The Healing Bell provides patients with the ability to ring the bell and hear and feel the chime and vibration as well as feel the texture of the bronze, funded by Michael Stekoll and Deborah Hansen, Angelo (Designer/Artist of the bell) and Beverly Grova, Dennis and Lynn McFarlane, and Elizabeth and Kevin MacPhail. View of the MPF Rehabilitation Garden from the back entry off of the Physicians Parking Lot. The garden also features lighting for the pathways, trellis' and landscaping. 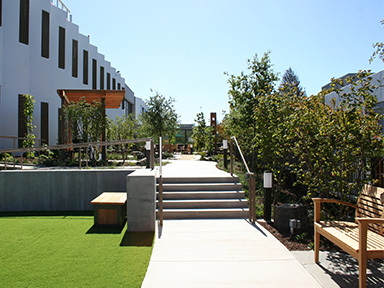 The rehabilitation garden features numbered ceramic leaf pavers which are 10m apart from one another to assist patients in learning how to walk or become mobile with equipment such as walkers, canes, and/or wheelchairs. 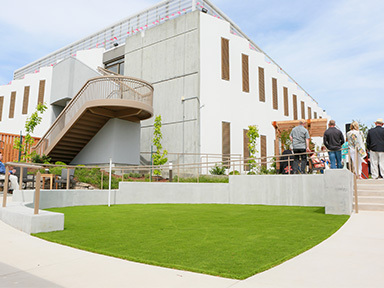 Decomposed granite, cement, artificial grass, and stone are among the various pathway materials to help simulate real-world scenarios. The Robert J Bernardi Therapy Area also contains an artificial grass surface with different levels of platforms for paitents to practice sitting and standing as well as for therapists to perform streching techniques. 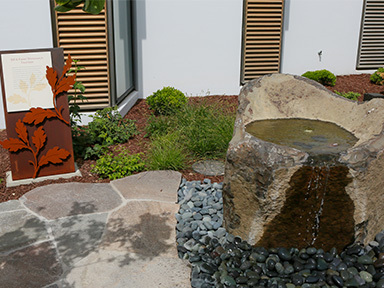 The Bill & Karen Moncovich, funded by Bill and Karen Moncovich, provides a water feature within the garden aiding patients with sensory stimulation and development. The garden also features many different types of plants and trees. 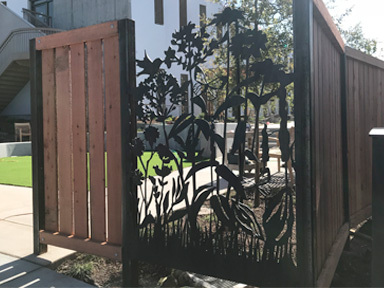 The back gate is adorned with beautifully designed corten steel panels which provides an additional artistic aesthetic to the garden, thanks to the funding provided by Bob and Bonnie Bernardi. 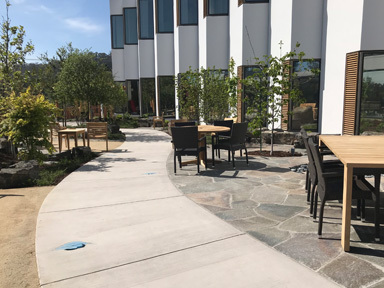 Different pavement surfaces, stair configurations and pathways help patients navigate with walkers, wheelchairs and canes in a real life environment. Putting green, oversized chess set and letter board assist with manual dexterity, balance, memory function and language skills. Various textured plants, water feature, bell, and designs promote sensory awareness.